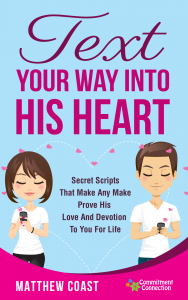 Text Your Way Into His Heart is a cheat sheet to knowing exactly what you should text a guy in order to capture his heart, created by my friend and fellow dating expert, Matthew Coast. ...And I want to make this the easiest decision you've ever made. That's why I'm giving you this special, one-time upgrade at a generous discount that is just too good to pass up. So instead of charging you $97, I'm going to knock off over 30% and invite you to share my success secret for ONLY $67! Now remember, once you leave this page, you'll never be able to find this deal again, so take advantage of it now while you can. And as always, I've taken all the risk from you with my 60-day 100% money back guarantee, no questions asked. If it's not obvious that this is a good fit for you, then it probably isn't. And that's okay! Just go get your main course and enjoy. Then please click the "Upgrade My Order Now" button below and I'll see you on the next page! Yes Helena, I definitely want to take advantage of this one time only massive discount offer. Please add the above course to my order for a one time only payment of just $67. Hey Buddy!, I found this information for you: "Feminine Enchantment – Upgrade – Cross – 1". Here is the website link: https://commitmentconnection.com/feminine-enchantment-upgrade-cross-1/. Thank you.